I recently came across Chris Spivey’s Harlem Unbound and reached out to see if Chris wanted to provide a digital review copy. He sent us a copy from DriveThruRPG and I dug through it over the weekend. Check out the full review below and drop a comment below (on the blog comments) to be entered in the giveaway. We’ll randomly select a winner from the commenters. Harlem Unbound is a Cthulhu Mythos game set in the Harlem Renaissance of the 1920s to 1940s. It is primarily a setting book, with character creation and rules integration with Call of Cthulhu 7th edition and Gumshoe. The book clocks in at 276 pages and has setting information, the gumshoe rules, character creation info for both systems, and a plethora of scenarios in both CoC 7th edition and Gumshoe. Harlem Unbound is also a frank and open discussion about issues of race within the world and within gaming. It directly addresses many of the issues that will come up at a table running the game, and within the context of the cultures that create those issues. Harlem Unbound starts out with a small introduction and history of the real world setting of the Harlem Renaissance. It then moves into setting information for the game world and character creation and rules modifications for the two systems. The full rules for Gumshoe are presented here, making the game a standalone entry for Gumshoe. For Call of Cthulhu, references to necessary sections found in other CoC books are contained within the character creation section. The storytelling section includes everything you’d expect to be in a “how to run this game” section, while also opening with a frank and open discussion about some of the challenges that will come running the game the interconnected discussion about race that will come up. The storytelling section ends with a few Cthulhu Mythos entities and creatures that can be used, and these are crafted to fit directly into the cultural mythologies that existed in 1920s Harlem. After the sections that are relevant to running the game, the 2nd part of the book is comprised of scenarios and scenario generators. Throughout the entire book are hooks for turning any piece of information into a potential plot, and that makes the whole thing an excellent resource for running any Cthulhu Mythos game. The last section is a few appendices that include period slang, a bibliography of historical and mythos works to help bring the setting to life, and a timeline of Harlem from pre-human era to the 1940s. 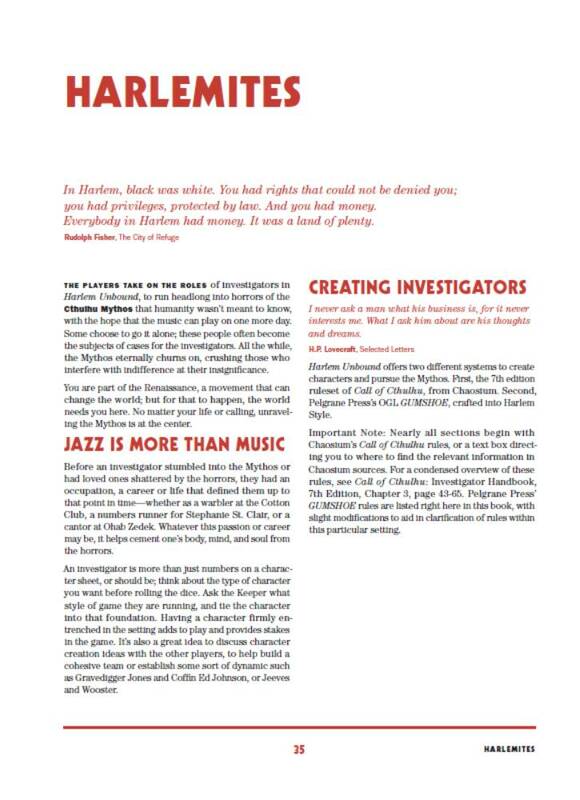 If the book were merely a historical fiction piece, these elements alone would be a great reference for any game or piece set in the Harlem Renaissance setting. The character creation section includes both Call of Cthulhu and Gumshoe options, and as mentioned above, has full Gumshoe rules and relevant CoC references. The character creation section is my only complaint with this game. I’m not super familiar with either rule set, and the CC section combines the character creation into one list. If I were more familiar with each system, it might be easier to delineate which parts were needed for which system “at a glance”, but determining how to untangle the two in that section was a bit harder and took more time. One distinct cheat sheet of CoC character creation and one distinct cheat sheet of Gumshoe character creation would have made it easier on someone like me coming to the rules with less experienced eyes. That being said, putting together a character wasn’t hard once I took a few minutes to read through Gumshoe character creation rules and detangle which sections related to which systems. Moving past character creation, the back to back nature of the systems throughout the rest of the book is good and makes it very easy to read the flavor text for a mythos entity and then fork into whatever system you are running. The scenarios are well organized, with the stat blocks and asides for Gumshoe easily delineated by red text. Each scenario in the book is excellently built to enable grabbing and re-positioning elements as needed within the adventure, or to snag the details of characters and mechanics to use in other games. Harlem Unbound has incredible attention to detail in representing the 1920s Harlem Renaissance. As a historical fiction game, it is phenomenally well researched and presented. Easily digestible historical elements are self contained in sections, enabling the storyteller to grab a location, person, or element and present it fairly accurately. The culture of 1920s Harlem is unfurled through the locations, and cultural context clues are presented in asides to help people convey the setting as an alive thing. As a mythos game, it is beautiful and strange in its rendition. Wrapping in the pre-human history of the area as underwater and home to the creatures of strange aeons, Harlem Unbound builds a beautiful tapestry of what came before and how it affects what is there now. The historical thread provides rich soil for cults and connections to previous eras, while showing how those bear fruit within the current time. 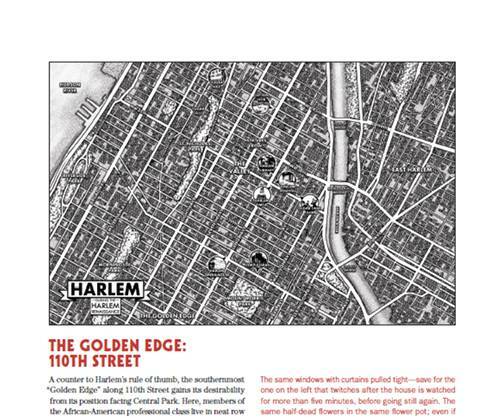 The in-depth descriptions of Harlem locations and figures of note make it easy to fill in the gaps when the players move to unexpected areas for the scenario. A nicely done map of the neighborhood shows enough detail to give the area depth while pointing out important landmarks. The map itself would be a great resource to print and use, and feels evocative of both historical city-planning maps and tourist-attraction maps, which enables it to fulfill multiple purposes at the gaming table. The writing is well done and dense, with a lot of content. The book comes in at 276 pages and each section has a hearty amount of content. Despite large chunks of text, the book is very easy to read, with large margins, asides, and a good break up of sections making everything easily digestible and quick to parse. This is a book made for running great games, and it focuses on what you need to run your game effectively and easily. The content conveying the game mechanics is straight to the point and provides what you need to understand what the mechanics of the game require. The non-mechanics writing style drops in bits of the author’s personality, making it feel like conversational at times. The writing tone is almost a syncopated mix of lyrical snippets, but delivered directly and forcefully. Almost emulates the musical style of jazz in the 20s, and I can’t help but presume that was a conscious choice during the writing. The little historical asides and hooks throughout the sections are great, and they give context for the setting and areas to easily extend any scene in your game into mythos fueled action. This is a book about race. With a setting of the 1920s Harlem Renaissance, there is no way for it not to be. The characters are assumed to be people of color, and the book frankly addresses this. It’s a conversation that needs to be had in order to run or play this game, and in some ways this game is that conversation itself. Sprinkled throughout the book are notes talking about the cultural context and realities of the situations of 1920s Harlem, such as the fact that many famous locales catered to white audiences and were unaffordable for black residents living right next door. Harlem Unbound does not pull punches when talking about race, and that’s a necessary component of the game. The tabletop roleplaying game scene is predominately white, and as a cultural reality, that crafts how a game like this enters the scene. It has to talk about the realities that exist and has to a do a kindness to the storytellers and players and teach them how to run the game. Harlem Unbound does just this, with the start of the storytelling section being a direct discussion about racism. It doesn’t just focus on the racism in the game setting, but in the context of running a game with your group. A nice little checklist of don’ts, and a frank discussion of potential implications and issues that come up with dealing with race, are at the beginning of the section to help eliminate some ambiguity for anyone tackling the role of storyteller. This is a game about playing non-white characters in Harlem in the 1920s, and a majority of gaming groups are mostly white. The author understands this reality and wrote this section to pull everything out into the open and to get the discussions started. The book talks about how to have discussions about the racial issues that exist and tries to provide some guidelines to get people over their (often unknown) biases. Look, we don’t get to control the conditions that create us, and we will never live in conditions which provide absolute equality. We get shaped by those conditions, and we absorb ideas and stereotypes. We don’t necessarily choose what covert ideas get thrust into our subconscious, but being able to deal with them means bringing these conversations into the open. If you are a white storyteller running for an all white group playing black players, it talks about that. If you are a white storyteller running for a group of different skin-color and cultures, this talks about that. If you are a black storyteller running for a mixed group, this addresses that. Long story short, in our gaming culture as it currently is, there is going to be some discomfort running a game like this, or even talking about this game. Get used to it. It’s okay. This is uncomfortable stuff because there is a power dynamic that disadvantages minority groups, and running a game that deals with that makes it hard to ignore, but there is an overwhelming amount of benefit in getting to a baseline where you can be uncomfortable with the discussion, but keep going. That alone, divorced form the excellent setting and game, makes this book worthwhile for every gamer to read. The artistic style makes strong use of silhouettes and negative space, often using red or black as a background color with strong white lines or characters depicted in negative space with black outlines. The use of negative space and color switching creates a very iconic style, and it calls back to posters of the time. When images are pure B&W or greyscale, they often have a small amount of spot color in deep red to accentuate and give a kind of horrid warmth to the scene, perfectly fitting in with the mythos tone. The entire layout is beautifully well done, breaking up the text well and interspersing header elements and a few runic embellishments around the asides that appear frequently to section the visual display nicely. The art used for characters and other non-decorative uses is well done and gives each character a visual personality, supplementing the descriptions and providing a good baseline for description. You should be checking out Harlem Unbound. It often feels like three intricately interwoven works that form a beautiful tapestry of 1920s Harlem and what lies beneath. The first part is a historical Harlem game that is detailed and alive, the second part is a Cthulhu Mythos game that has a rich and detailed setting to interplay against, and the third part is a frank discussion on race in games and the gaming industry. Each of these three parts supports each other and brings a unique perspective to the table. I’m going to upgrade what I said earlier. 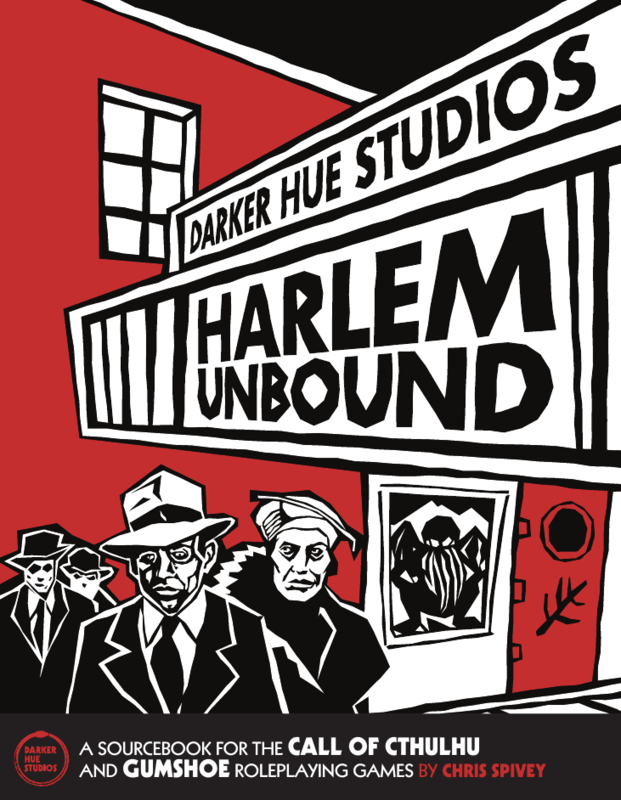 You NEED to check out Harlem Unbound – it’s a brilliant game and a brilliant discussion about running games. We want you to check out Harlem Unbound, so we’re going to be giving away a hardcover copy of the book. All you have to do to be entered is to leave a comment below with a valid email address (so we can contact you) between now and January 21st. You can sign up for an account on the site to make it easier. We’ll randomly choose a winner (by dice roll), and as always all of our Patreon patrons are automatically entered into our giveaways. Please review our comment policy before commenting. I find it deeply satisfying that Chris Spivey keeps appropriating the (frankly) racist works of Lovecraft to create engaging and progressive conversations around race. Would love to dig through his discussion of how to handle race at the table. A very valuable resource, I’m sure! So very excited. This is why i read gnome stew – to find things to bring to the table like HU. This looks amazing. This is a great review and I am especially interested to read the author’s thoughts on running this group for groups with different player makeup. Thanks for writing such a thorough review. I’ve been wanting to give this one a read since I saw its crowdfunding page a while back. One of these days. I’ve had this on my wishlist for a while, but this just pushed it to the top. Thanks for the review! I’ve been on the fence about this one. Sounds interesting. 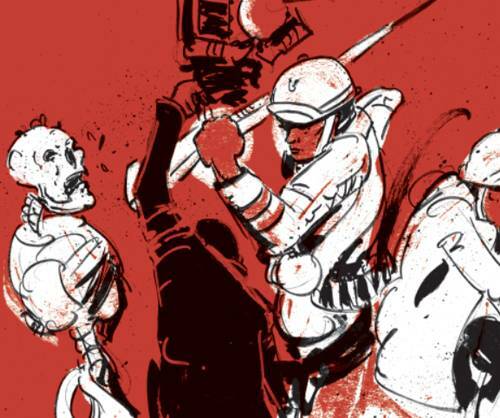 Few games handle the issue of race, and that alone draws me toward getting this setting book. It looks like a really interesting take on the Lovecraftian word. I had no idea that this is what the game was about. Thanks for the informative review. I’d love to win a copy even if just to shake up my middle-aged white guy perceptions. I would really love to have this. Always interested in building social conundrum into games. I really appreciate how gaming materials like this are not only becoming increasingly common, but are getting attention outside of the weird indie corners of the RPG space. I think it demonstrates how our hobby is growing as a medium. I’m currently running my first adventures of CoC7ed with my group and reading this review makes me feel very excited of this title! I have been excited about this since I first read about, glad to hear it is everything I hoped for. Sounds like a really in depth and informative resource. Congratulations James! You came up with a random dice roll at number 33 to be the winner! I’ll shoot you an email to get shipping info! I own this book and I agree strongly with this review ! Big fan of Chris’ contribution to Cthulhu Confidential. I’d love to take a look at what he’s done here. I would love a copy. Looks neat. Checked it out previously but excited to read your review. I’d love to check out this book—I didn’t back the KS at the time, but it really caught my eye! Looking into starting up a Trail of Cthulu game. Sounds like this would be a solid add on? Thanks for the heads up. Feel free to mail me the freebe 😉 (I’ll plan on just having the ol’ FLGS order me one. This looks highly intriguing. I’ve been trying to convince my group to play in 20-30’s era New York but they seem chary of the historical setting. I guess it’s not as shiny as elves and hobbits. The detail that the author seems to have included about running adventures with diverse groups sounds very positive, and I’d love to read more. Can I enter the giveaway living outside the US? Thank you! Yes, we’ll have to use a slightly different process to get it to you if you won, but we would just modify the fulfillment process to fit. We’ve shipped one or two giveaways to people who lived outside our shipping country of origin. What an interesting setting for a Cthulhu game. I’m very interested to give this one a read. Thanks for the opportunity. What an interesting setting. I am looking forward to giving this book a go soon. Thanks for the opportunity. We’ve already set half of NYC aflame in our game, so I’ve held off any new purchases to help handle my backlog. That being said, another great review means this must end up on my shelf sooner rather than later. Fantastic review! I appreciate your take on this excellent new supplement. Thanks for the opportunity to be entered into the drawing. What an exciting project! Sad that I couldn’t kickstart it, but hoping to check it out soon. Definitely want. didn’t have the funds to kickstart at that moment. Do you know if copies will be available at Garycon? Definitely want. Didn’t have funds during the kickstarter. Will this be available at Garycon? Want! Will this be available to purchase at Garycon, I wonder? I’ve been eager to read this, too. His work on Cthulhu Confidential is excellent! Definitely need! Do you know if this will be available for purchase at Garycon? This game definitely sounds like a must read! I picked up the .PDF and am deeply impressed with his book. I love the way that Mr. Spivey dropped in what feels like a million and one adventure ideas for how he envisions these games running. This, to me, is the most exciting gaming product released last year. And the Giveaway is closed with James Haughton being the lucky winner. We took the list here and all of our patreon supporters, randomized it, and rolled a dice. #33 came up for James! Thanks for all the entries, and go check out Harlem Unbound for yourself! I finally got off of my duff and ordered the hard copy directly from http://www.darkerhuestudios.com . Can’t wait to get it in my hands!